As Disney Parks Blog readers know, when Buena Vista Street opens next year its centerpiece will be the Carthay Circle Theatre – home to the premiere dining location in Disney California Adventure park and a living tribute to a definitive moment in the history of the Walt Disney Company. 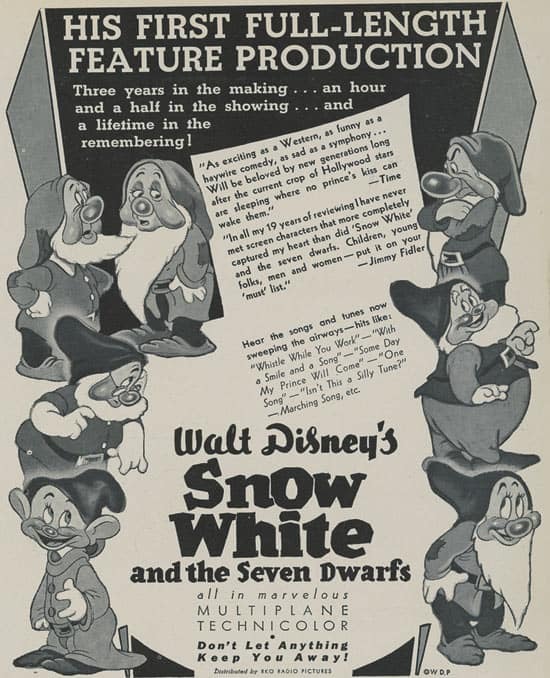 On December 21, 1937, “Snow White and the Seven Dwarfs” premiered to a record-breaking audience at the Carthay Circle Theatre in Los Angeles. News clippings from the time quote theatre manager Ray Ducerne, who reported that advance ticket sales outpaced every other picture ever booked at the theatre, resulting in a sold-out opening night. Advance demand for tickets was so strong that sales were limited to four per person. More than 30,000 fans who couldn’t score one of the $5 tickets gathered outside the theatre just to be a part of the historic event. Opening night at the Carthay Circle Theatre was a spectacular event. 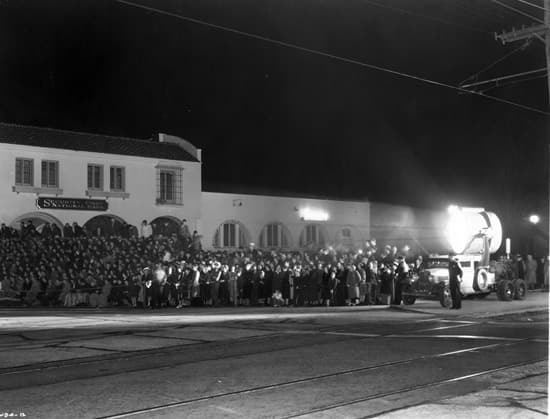 Crowds lined up around the block, and huge floodlights illuminated the scene. Walt and Lillian Disney arrived to enormous fanfare and enjoyed the screening alongside such celebrities as Shirley Temple, Charlie Chaplin, Marlene Dietrich, Milton Berle, Ginger Rogers, Cary Grant, George Burns and many more. The Carthay Circle Theatre at Disney California Adventure park will mark this game-changing night for Walt Disney and his burgeoning studio – a tribute to an enormous risk that turned into a golden opportunity. 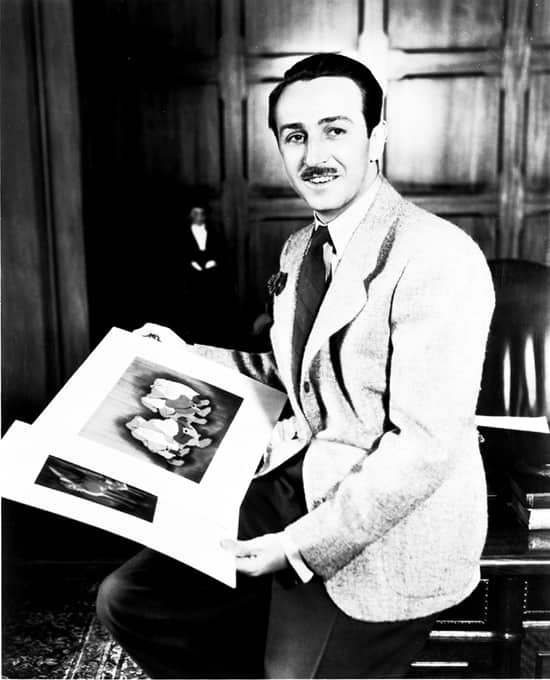 “Snow White and the Seven Dwarfs” was not only a financial success, but it set the stage for countless animated classics which would follow and paved the way for the rest of Walt Disney’s dreams to come true. I’ll leave you with one more look back in time – the film’s playbill. Robert from FL – I checked the address on Google and it appears to be a small park now, flanked by commercial buildings (6310 and 6330). Hi Erin – I don’t know if you will read this or not, but it is worth a shot – that second picture from the top, the old Ford pick-up with the spotlight on the back? Is there anywhere I could get a larger/original size version of it? Is it available for purchase anywhere? My husband is a HUGE Disney fan and a huge Ford fan and we have a truck very similar to the one in that picture, and he was so excited to see that picture!! I would love to be able to get a print of it to frame on our wall (with some other great vintage Disney pics we have). I can’t wait! DCA will be amazing when this transformation is complete! 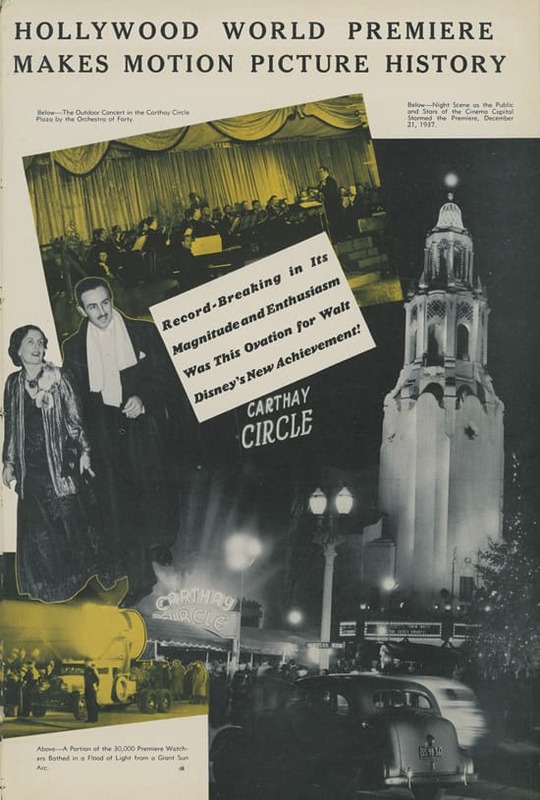 Since I doubt the original Carthay Circle Theatre is still standing, does anyone know what is in its place? Where was the theatre located? When did it close? I too can’t wait to see it at California Adventure. I hope I go there next year! I can NOT wait to see the DCA improvements and hear more about the restaurant inside. Walt banked it all on SNOW WHITE and I just KNOW the park improvements would make him proud. I will be making my advanced priority seating arrangements for my 2012 trip so I can see the interior of the Carthy Circle building. Perhaps a ride on the trolley car first will wet my appetite! How exciting! Filet Mignon was 60 cents but the movie ticket was $5? Great post and wonderful photos. I don’t think I’ve ever seen the playbill before. I love the vintage stuff. The Carthay Circle Theatre is going to be a great icon for California Adventure! I love this. Keep up the good work. I love the history of Disney and especially Snow White, my daughters favorite!! What a gala night it must have been! Thank you for sharing this with us.